I sure am enjoying these final weeks of sewing for baby. I only have a blanket left to make. I'm contemplating skipping a baby quilt this time in favor of a voile/flannel receiving blanket. 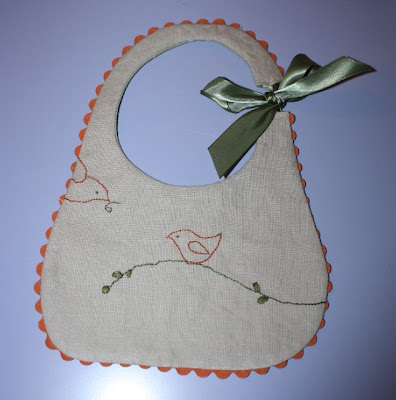 I made one for a friend's baby and the two fabrics were so lovely together. It's also the perfect weight for the still warm Texas fall weather. Speaking of fall, I am also planning the projects I have yet to make for my other little ones before baby arrives. Halloween costumes and winter jackets are on my list. And a picnic blanket. The fabrics and bias binding for said blanket have been cut and waiting on my shelf for at least a year. Maybe two. My track record with blankets is pretty abysmal. The (free!) pattern can be found here. I fell in love with this bib upon first sight. The mama and baby bird are so sweet. I also wanted more practice at embroidery. I learned basic embroidery from this tutorial for this project. When I was in the midwest earlier this month, my mom taught me how to make a french knot. I love the way they look and they are so easy to make. If you don't have someone to show you, this video tutorial is great. I wondered whether we really needed an embroidery hoop for this project. My mom said yes. Being one that insists on learning through experience, I tried without. My mom was right. 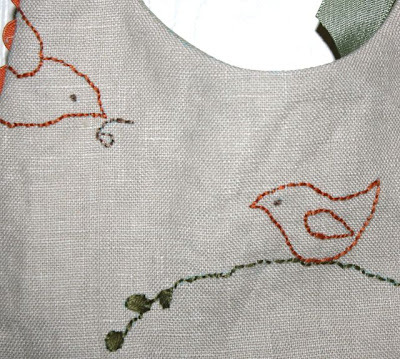 You definitely need an embroidery hoop or the fabric will pucker. Just sayin'. This bib isn't exactly practical. It's linen. It's light-colored and sure to show stains. I don't know how the ribbon (or the embroidery!) will hold up through repeated washings. I was not deterred. However, from past experience, I do believe the most practical bib would be made from a laminated cotton. 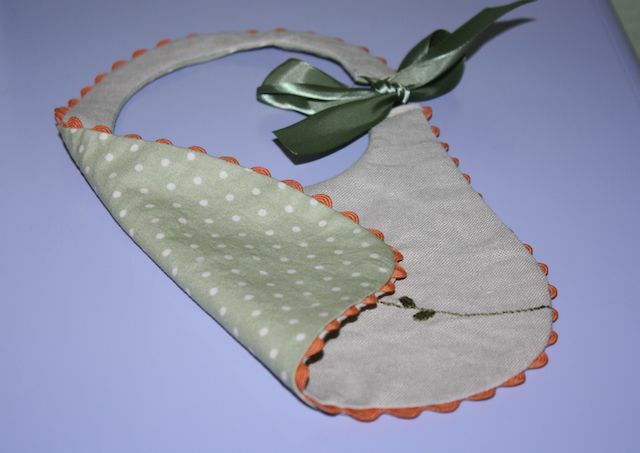 Laminate is wipeable - perfect for bibs! These two tutorials look fantastic.